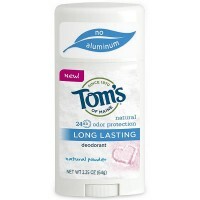 Uses We hope you enjoy our aluminum-free Natural Long-Lasting Deodorant. Zinc ricinoleate fights odor naturally by absorbing odor caused by microbes, herbal ingredients neutralize bacteria, and lemongrass fragrance provides a pleasant aroma. What's more, the container is recyclable - the first of its kind in the industry! 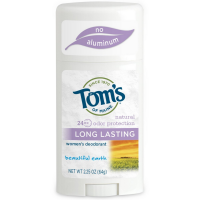 How our long-lasting deodorants work: Chemicals produced by skin bacteria cause odor - so how can you stop them? There are three methods: block the chemicals with perfumes, neutralize the odor-causing bacteria, or bind up the odor molecules. Tom's aluminum-free Natural Long-Lasting Deodorant uses all three ways to keep you smelling fresh, naturally. We use the odor-neutralization properties of zinc ricinoleate; sourced from castor beans, to trap and absorb bad smells. We also rely on the antimicrobial properties of the herbal ingredients lichen and coriander to neutralize odor-causing bacteria. 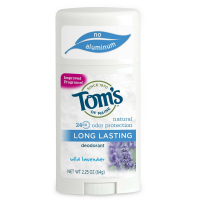 Finally, we encapsulated the gentle fragrance of lemongrass so that it lasts longer. No artificial or animal ingredients. No animal testing.